After floating accusations against U.S. military radars, flawed foreign parts and space radiation, Russian space officials have concluded a software glitch caused the failure of the Phobos-Grunt Mars probe. The commission investigating the mishap says Phobos-Grunt's $165 million mission was halted by "a programming error which led to a simultaneous reboot of two working channels of an onboard computer," according to RIA Novosti, a Russian news agency. The reboot put the spacecraft in safe mode, according to the report released by Roscosmos, the Russian space agency. The probe went into a sun-pointing orientation to maintain an electrical charge and await further commands, Roscosmos officials said. The problem struck shortly after the Phobos-Grunt spacecraft launched Nov. 8. A Zenit rocket boosted the hefty payload into low Earth orbit, then two more rocket firings were planned several hours later to propel the probe toward Mars. But the craft's rocket pack never fired because of the computer reboot, leaving the craft stranded in orbit several hundred miles above Earth. Russian engineers were unable to establish contact with Phobos-Grunt again, and except for two brief communications sessions with a European Space Agency ground station, the satellite remained silent. Tracking data indicated Phobos-Grunt raised its orbit in the days following the anomaly, and information shows the spacecraft changed its altitude at least 10 times, according to Ted Molczan, a respected satellite observer based in Canada. Molczan said the orbit maneuvers were "almost certainly" from thrusters designed to control the probe's attitude and settle propellant before the two burns of the craft's main engine to guide Phobos-Grunt to Mars. The orbit change observed by U.S. military tracking assets was roughly equivalent to 22 ullage, or propellant-settling, thruster firings as they were planned under the mission's normal launch scenario, Molcan posted on Satobs.org, a website for satellite tracking hobbyists. The data could be evidence the spacecraft repeatedly tried to fire its rocket engine and aim for Mars. Vladimir Popovkin, head of Roscosmos, told Russian reporters radiation damage could have caused the unexpected computer crash. Former Planetary Society executive director Louis Friedman said Phobos-Grunt's orbit was below the radiation belts surrounding Earth, placing that explanation in doubt. The root cause listed in the official failure report was the use of computer components not qualified for spaceflight. "Cheap parts, design shortcomings, and lack of pre-flight testing ensured that the spacecraft would never fulfill its goals," Friedman wrote in a posting on the Planetary Society website. Friedman managed a Planetary Society experiment in which microbes from Earth were launched on Phobos-Grunt to study how basic life forms can weather an interplanetary voyage. He also has close ties with officials at NPO Lavochkin, Phobos-Grunt's prime contractor. Loaded with more than 11 tons of rocket propellant, Phobos-Grunt crashed back to Earth on Jan. 15. Most of the craft burned up in the atmosphere over the Pacific Ocean west of Chile. Russia commissioned investigators, led by former Russian space agency director Yuri Koptev, to look into the failure beginning in December. The board submitted their findings to Roscosmos on Jan. 30, and a summary was published on the Roscosmos website Feb. 3. Koptev told Russian media in January that U.S. military radars in the Pacific Ocean could have frazzled Phobos-Grunt's computer, but officials later backed away from that accusation. 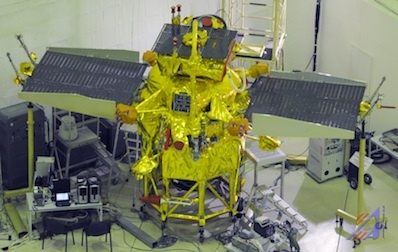 Phobos-Grunt was designed to release a small Chinese satellite in orbit around Mars, then retrieve samples from Phobos, the red planet's largest moon. The material was to be returned to Earth in 2014.